15 years ago, Stephen King did something quite unusual forh the publishing world: he released two books simoultaneously. The first, Desperation, was released under his name, and the second, The Regulators, under his pseudonym, Richard Bachman. An interesting (and profitable) move that went down in the annals of unusual events for the publishing world. Why am I telling you about this? First, I always look for an excuse to talk about Stephen King and while a double-release seemd like reason enough, I did some digging and found that while popcorn is supposedly his favorite food, he (at one time anyway) dabbled in cooking. What would Stephen King like for Halloween? Transylvanian Goulash. Once upon a time, according to a Cincinnati reporter, the master of suspense himself submitted a recipe for his favorite Halloween meal -- Transylvanian Goulash. Sounds ominous doesn't it? The dish itself is surprisingly tasty and great for comfort food on a dark and stormy night. 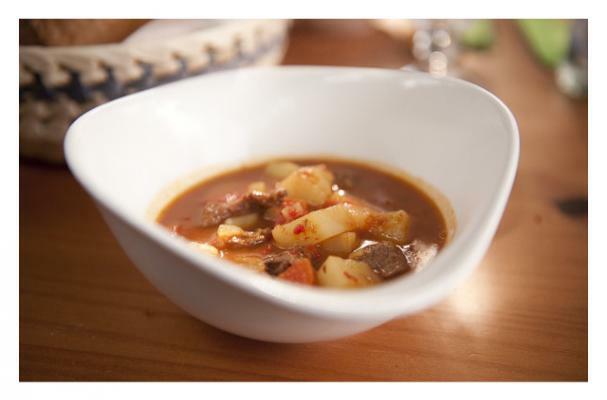 Click here for and adapted recipe for King's Transylvanian Goulash!